It’s amazing to see the creativity at work lately in the area of infographics. As I’ve written before, this informational, educational art form has been around for a long time. But 2012 really seems to be the year when it caught fire. PR Daily 12Most.com’s Anita Hovey recently listed some of the top infographics in the world of social media. Among the best was “Seven reasons to embrace online culture,” by J6 design. From “showing you are human” to “don’t ignore negative online reviews,” these are great tools to have in your toolkit if you find yourself having to convince the boss to include social media as part of your office’s overall public relations and marketing efforts. But, since social media has empowered the “me” in all of us to an extent never before seen, my favorite infographic has to be “What About Me?” from Intel. 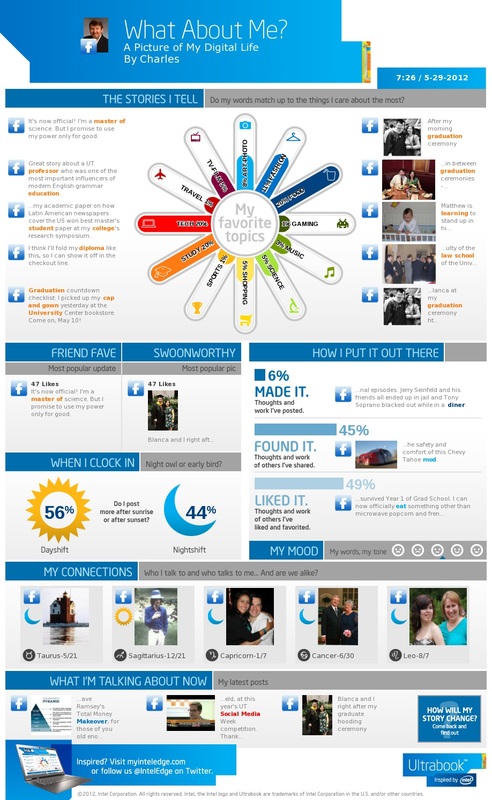 This free online service mines your Facebook and Twitter feeds to create a custom infographic about little ol’ you. Here’s mine. This is the thumbnail version, so click to see the larger version. Fascinating, huh? I think so, but then, that’s just me. And it can be you, too. I’m not so sure it will make me famous, though, or even infographic famous. And maybe that shouldn’t even be my ultimate goal. I’m just happy looking at a graphically pleasing, informative display about the details of my online life, in a way that can help me be a better communicator and a better person.